Selecting (Top 10) in a drop-down list allows you to display a certain number of items from the top or bottom of the column. You can also use this option to display a certain percentage of items in the column. This can only be used on Numerical Columns and not text columns. 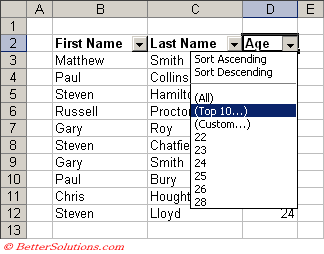 In column "D" select the drop-down arrow and select (Top 10). This will display the "Top 10 AutoFilter" dialog box. In this example we are going to display the top 4 items from the Age column. Select (Top 10�) to display the "Top 10 AutoFilter" dialog box. Select "Top" in the first drop-down, "4" from the spinner control and then "Items" in the last drop-down list. Press OK to display the top 4 items in the "Age" column. In this example we are going to display the bottom 20% of items from the "Age" column. Select "Bottom" in the first drop-down, "20" from the spinner control and then "Percent" in the last drop-down list.